Ranger Ramblings: Part II is finally ready for teaching! I had a really great time experimenting with techniques I hadn’t tried before. I also used the Ranger Distress Stains for the first time and absolutely love them! The colors are so much more intense than Distress inks. I practiced some different techniques with embossing powders I hadn’t done before and am really pleased with the results. It’s just so much fun to sit and play with techniques I’d been wanting to but never got around to. I tend to collect techniques, tutorials and You Tube videos for future play dates. I have folders full of printouts, and loads of sites bookmarked in my ‘favorites.’ I was finally able to utilize some of the better ones for Ranger Ramblings: Part II. I’m excited about the class and think you’ll really enjoy it. 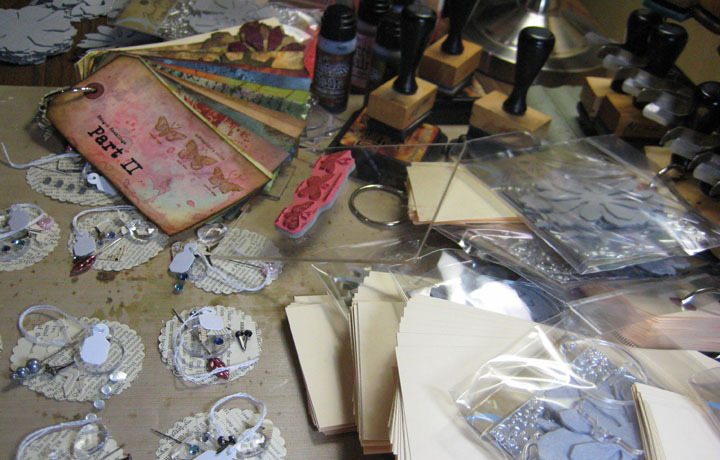 I even fell in love with some of my older Tim Holtz stamps that had never been used before! I’ve incorporated more time for playing and experimenting, plus you’ll receive an extra stash of ‘treasured inspirations’ to use in creating your own beautiful tags utilizing techniques learned in class. This workshop is currently scheduled for Scrapbook Peddler in Saginaw and Capture-A-Memory in Flint; Scrapbooks Galore & More in Midland should be set soon. Join me for a date of fun and creativeness! Check out my calendar for times and dates or visit the store Web sites. can’t wait to take your class at Capture-a-Memory! !